Adventure for a cause.. click on picture to see the album. 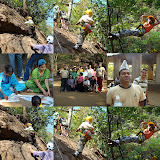 To inculcate the values of team work and adventure to kids so that they grow up as more confident citizens. Nature Knights (www.natureknights.com) and Dream India (NGO who does work for underpreviledge children ) togather organised a Charity event on December 23, 2007. 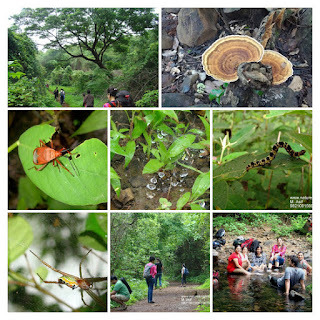 Nature Knights conducted a workshop into two sessions (First half of the day adventure workshop "Nature Walk, followed by adventure session which allowed children to learn Rappelling, Valley Crossing and Basic Rockclimbing". Post lunch session was "Art and Craft using Recycled material and Nature". Post lunch workshop was anchored by Usha and Sejal from Fundays. (Thanks Fundays for supporting Nature Knights and Kids). Fundays organises workshops for kids. There was a great response for support from volunteers from Nature Knights, Dream India and Fundays..It reminded me of the movie ARK...which had a message at the end what was Noha's ARK and why the hell did he bother help all the species of the planet to survive from the great storm..It was just "A-nother R-andom act of K-indness.